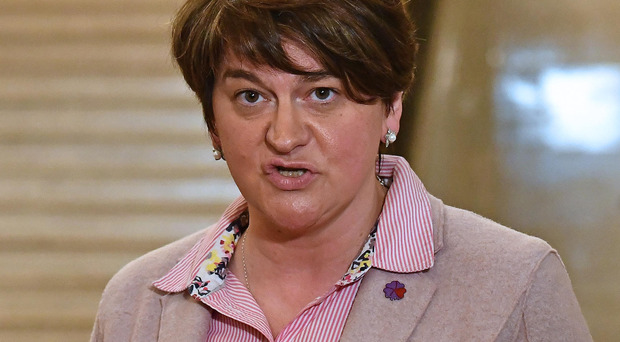 DUP leader Arlene Foster has suggested her party could be open to a 'Norway plus' style Brexit arrangement. Representing a softer Brexit, its proponents argue that it would avoid a hard Irish border, with the UK staying in a customs union with the EU. But TUV leader Jim Allister last night said that such an option, which is gaining support among MPs, would "make a mockery of Brexit" and not deliver what people voted for. UUP leader Robin Swann said his party was prepared to look at all the alternatives to Theresa May's "unacceptable" current deal but he stressed that any solution must be "UK-wide". Sinn Fein said the DUP couldn't negotiate their own agreement and there already was a Brexit deal on the table. Speaking to BBC Radio 4's Today programme yesterday, Mrs Foster said she would not support calls for a second Brexit referendum, as the UK had already voted to leave and "we respect that". Repeating the DUP's opposition to Mrs May's deal, she urged the Prime Minister to "not waste time" on it and instead look for a better solution to the border question. She hinted that if the current Withdrawal Agreement failed to get through the House of Commons, her party could be open to a 'Norway plus' style arrangement, where the whole of the UK stayed in the customs union until an agreement with the EU is reached on future trading relations. Would membership of the EEA work? Ms Foster said the DUP's "one red line" was to make sure Northern Ireland was not differentiated from the rest of the UK in terms of customs and was "not prescriptive" about other potential options on the future relationship with the EU. But a Norway plus-style arrangement has been rejected by the TUV leader. Mr Allister told the Belfast Telegraph: "It would retain us fully within the EU single market, subject to all Brussels-made rules - adjudicated by the European Court of Justice - and maintain free movement of labour and require ongoing payments to the EU. That is not Brexit. "But for us it would be worse, because the Norway plus that is being talked about would additionally keep Northern Ireland in the customs territory of the EU - completing the repudiation of the Brexit that was voted for. Thus, the backstop would essentially still apply." Mr Allister continued: "The core of the backstop is that Northern Ireland alone remains part of the customs territory of the EU. "With the EU likely to only agree a Norway-style deal which had this add-on, it would leave us incarcerated in the EU in perpetuity." The UUP did not appear to rule out a Norway plus style arrangement. Mr Swann said: "The Ulster Unionist Party cannot give our support to the Withdrawal Agreement and its disastrous backstop. However, we will look at every option and assess its merits - but the bottom line for the Ulster Unionist Party is that any solution must be UK-wide in its entirety." Sinn Fein MLA Mairtin O Muilleoir said: "There already is a deal on the table - it's not perfect but it avoids physical infrastructure on the border. "The DUP cannot negotiate their own deal. Nor can they back a deal that isn't there. "The EU has recognised that a unique solution is needed for the north because of our historical and geographical concerns. The backstop recognises that - that must be maintained." Mrs Foster told Radio 4 that Mrs May's deal would see Northern Ireland "diverge off from the United Kingdom" and she urged the Prime Minister to "look for a better deal" that "takes back control of our money, of our borders and of our laws". Reiterating that the DUP's 10 MPs would not back the Withdrawal Agreement on December 11, Mrs Foster said it would create a "huge democratic deficit" in Northern Ireland. Mrs May yesterday rejected a suggestion that the failure to get a deal with the EU would see the UK stuck with the Northern Ireland backstop plan permanently. She was responding to Andrew Murrison, the Tory MP and chair of the Northern Ireland Affairs Committee, who compared it to a "post-war pre-fab". He said: "It's sold as temporary, it's built to last, and it's likely to outlive us all." However, the PM dismissed his comments and told the House of Commons' Liaison Committee it would only ever be a temporary solution. She added: "Neither side thinks the backstop is a good place to be." Mrs May admitted that it would not be possible for the UK to unilaterally withdraw from it, though. But she said this was a guarantee to the people of Northern Ireland there would never be a hard border in place. Mrs May also rejected the claim that passing her Brexit deal in Parliament without the DUP's support would lead to the end of her partnership with Mrs Foster's party. "Actually, the DUP have themselves said that the confidence-and-supply agreement remains in place," she stated. Mrs May refused to be drawn on what would happen if MPs down the Withdrawal Agreement. But she insisted a second referendum was not an option as it could not be held before March 29, 2019 when Britain leaves the EU.